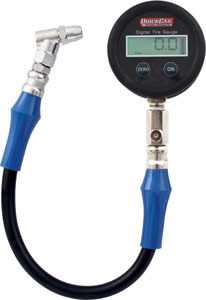 This QuickCar Digital Tire gauge most accurate gauge available, calibrated to .5% accuracy. Reads PSI, Bar, KG, or KPA. Auto shut off for long battery life, and a backlit screen for ease in viewing. 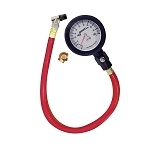 Gauge also features a rubber boot for protection, and is mounted on QuickCar's high quality 14" whip hose with strain reliefs and angled chuck.